I don't really remember this which is odd because my family and I did like eating at Burger King sometimes. I haven't eaten at Burger King is years. The one closest to our house recently went out of business. But I do remember the "original chicken sandwich" and I loved it. Not any of the later versions, but the original. I may have to seek out another local BK and see if I still like it as much. There is nothing wrong with fast food...once in a while. I remember this sandwich, and I thought it was pretty good. They just put too much mayo. The original chicken sandwich was the only thing I would eat at Burger King when I was a kid!!! YUM!!! Haven't had one in a VERY long time! As a teenager I used to work at Burger King. I think I lived off of those chicken sandwiches! I always asked for tomatoes and cheese because they weren't included on there. I will admit that we occasionally eat there. I have had all of those! It's what I order when I go to BK (rarely) but I get no mayo, not a fan of it! I love Bk's chicken sandwiches!! There fries are the best too, since they changed them a few years ago. I was never into the chicken stuff at the fast food places. Give me good ol' red meat (or what they pretend is real meat, anyway) any day! HA! 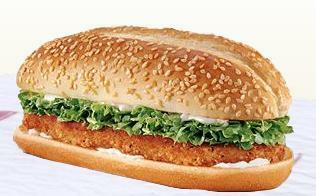 This chicken sandwich is the only thing I would ever eat at BK. I think the rest of the food is nasty - not because it's fast food, I do indulge in fast food more than I should. I just think BK is gross. This was my very favorite thing to get at the BK. Don't remember the tomato thing though. Coming by to say: Hi. I miss you. PS I liked those chicken sandwiches. I so remember this because I used to get it all of the time. They do put way too much mayo on it usually so I end up scraping most of it off. Wow! I haven't had one of these in ages. I have had issues with BK ever since they changed their fries years ago. There is something about the oil that they cook in that gives me the runs. And yes you are welcome for that thought. But occasionally I do stop by a BK since the hubs and my kids love it. But I usually get the Grilled Chicken Sandwich or BK Broiler or whatever they call it now. Now I want BK and their onion rings with the sauce! I love Whoppers too much to ever order anything else at BK. It's funny you mention the tomato thing because recently there was a tomato shortage in Canada and BK stopped putting tomatoes on their Whoppers because they were too expensive. I didn't think I'd miss them, but I did! I think the same would go for if they weren't there but then suddenly were. I have a BK near me, and will occasionally go when I'm too lazy/tired to cook. Just a note though: The Italian Chicken Sandwich is BACK! It was gone for a while, during which time I boycotted BK because that's the only thing I get, but it's back!! PS. I'm your newest follower. Loving your blog!